President Maithripala Sirisena expressed deep appreciation to China for providing continuous assistance for development of Sri Lanka. He made these remarks when he met with a group of senior delegation of the Communist Party of China, headed by the Party’s Deputy Leader and Mr Zhang Baowen, Vice Chairman of the Standing Committee of the National People’s Congress of China, at the President’s Official Residence in Colombo yesterday (20). “When we travel across the Colombo as well as around the country we can see many development projects funded by the government of China”, the President said, adding that he expects the continuous assistance of the government of China to the Sri Lankan government in the future too in achieving the development goals of the country. Sri Lanka expects the fullest cooperation from China to overcome the challenge of poverty in the country, President Sirisena said. 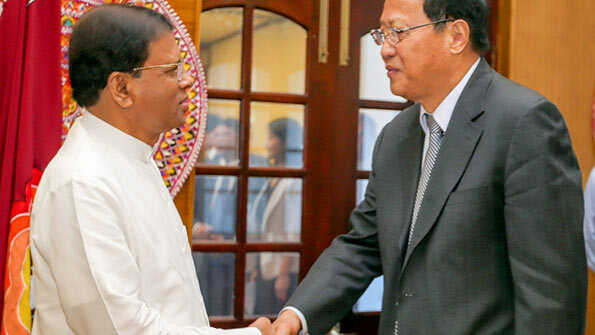 The two leaders specially discussed about the long standing relationship between Sri Lanka and China as well as the relationship between the Sri Lanka Freedom Party (SLFP) and the Communist Party of China. The President recalled that every time when SLFP forms a government the relationship between the government and the Communist Party was strengthened. The President thanked them for the continuous assistance provided for Sri Lanka by China in international fora. The President also expressed his appreciation over the service rendered by the Chinese Ambassador in Sri Lanka to strengthen the ties between the two countries. Mr.Zhang Baowen presented a memento to the President on this occasion. The present government is not led by the SLFP and sri Lankans are governed by a minority government led by the UNP. As it is the government is preoccupied with projects that does not benefit the peasant and working population and if we are to get anywhere then the government ought to prioritise issue that concern them and they are moving away from them. A case in point the function of the Paddy Marketing Board which is designed to serve the peasnt population. The government decrees a guarantee on some agricultural produce like rice and so far they have not been able to implement this for various reasons. The government boasts about how many millions or even billions are allocated but then they fail to purchase the produce for problems of storage. The peasants are forced to sell the produce to the private traders well below the guaranteed price. The irony is that these traders burrow money from government banks and eventually sell the milled paddy to the government. The cost of the megapolis is disaster for it will cost billions of dollars and the government will have to borrow money from private banks at high interest rates that will push our economy to the brink …like the Greeks. Government should be preoccupied with provide security to the peasants by giving them subsidies to produce more and then build the infrastructure to either market or export the produce. If the government can provide this service for tea and rubber why not paddy production.